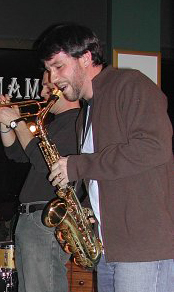 Saxophonist, Chris Veilleux earned his B.A. in Jazz Studies from Northern Illinois University and his M.M. in Contemporary Improvisation from the New England Conservatory of Music in Boston. He studied with Ran Blake, Joey Sellers, Steve Duke, Jerry Bergonzi, Allan Chase, Charlie Kohlhase, and Anthony Coleman. Chris was a recipient of Downbeat magazine’s 26th annual student music award under the category of Best College Chamber Music Group for a classical saxophone quartet recording. Beyond that, his studies in various styles including jazz, free jazz, world music, and rock, make him particularly versatile in both teaching and performing. He currently teaches and performs on saxophone, clarinet, flute, and ney (Ottoman reed flute). Chris co-leads the sax, guitar, and drums trio Industrious Noise (Creative Nation Music), as well as the trumpet, sax, bass trio, Roving Soul (Nada Brahma Records), who have both released recordings. Chris is a member of Jerry Sabatini’s, Sonic Explorer’s, Skordalia (Greek Band), and recently started The Fa Diyez Ensemble, an ensemble dedicated to playing Ottoman Classical Music. Chris is a faculty member and Woodwind Department Coordinator at the Brookline Music School. He also teaches at the Rivers Conservatory of Music and for the Making Music Matters!, a program in the Boston Public Schools.